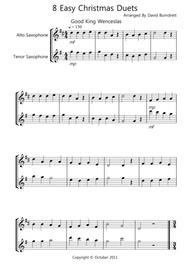 8 Easy Christmas Duets for Alto And Tenor Saxophone composed by Traditional.. Arranged by David Burndrett. For Saxophone. Christmas. Easy/Beginner. Sheet Music Single. Published by David Burndrett (S0.7984).Eight Easy Christmas Duets! Good King Wenceslas, The First Noel, Jingle Bells, Silent Night, While Shepherds Watched, Away In A Manger, O Come All Ye Faithful, Ding Dong Merrily On High. I have arranged these duets so that they can be played by players of all standards. Each part gets the tune! Photocopying for your own use is permitted but distribution is strictly prohibited. My email address is d_burndrett@yahoo.co.uk if you have any questions or requests.About Digital Print Sheet MusicDigital Print is printable sheet music available anytime, anywhere. Just purchase, print and play! View your online sheet music at home, school, work or anywhere you have a computer connected to the Internet. Use our iPad app to view your digital sheet music on the go. With Digital Print, you can print your digital sheet music immediately after purchase, or wait until its convenient. And our software installation is easy - we'll guide you through the simple steps to make sure you have Adobe Flash Player, Adobe AIR and the Sheet Music Plus AIR application.